The Hoya Revo is a significant advance in filter technology. The coatings and precision build quality is simply unparalleled. For flare-free and dust-free photos. These coating are overlaid with a clear water & stain resistant coating that is easy to clean. 77mm Hoya Pro 1 Digital Filter. Condition is Used. In original box..
New and never used but the packaging is a little worn. Professional quality protection filter from market leader Hoya. Multi-coated glass. The Pro1 filters from Hoya are the pinnacle of filter design and are renowned for their ability to minimise reflection at the filter surfaces which reduces flare and ghosting. Features hardened, antistatic top-layer is water repellent, stain and scratch resistant, and cleans easily when smudges or fingerprints are introduced to the surface. Fits to lenses that are threaded for 52mm filters. 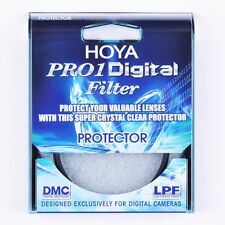 Hoya 49mm HD High Definition Digital Protector Filter is a lightweight and durable filter which is compatible with lenses that accepts 49mm filters. The filter will not affect the colour balance or performance of the lens. 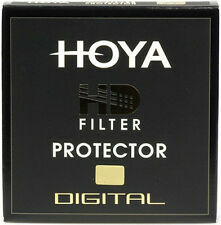 Hoya 77mm Pro 1 digital MC protector filter, no case. No case or pouch included, the filter will be supplied loose. Circular Size: 46mm. Filter Type: Protector. Filter Material: Glass. Key Features. Key Specification. Super multi-coating eliminates reflections on the surface of the glass and enhance light transmission. Circular Size: 58mm. Filter Type: Protector. Filter Material: Glass. Key Features. Key Specification. Super multi-coating eliminates reflections on the surface of the glass and enhance light transmission. Professional quality protection filter from market leader Hoya. Multi-coated glass. The HD filters from Hoya are the pinnacle of filter design and are renowned for their ability to minimise reflection at the filter surfaces which reduces flare and ghosting. Circular Size: 72mm. Filter Type: Protector. Filter Material: Glass. Key Features. Key Specification. Super multi-coating eliminates reflections on the surface of the glass and enhance light transmission. Good condition though the outer ring is slightly dented(see pics), shouldn't affect use and still screws onto a lens smoothly. Features - Hoya 49mm Pro-1D MC Protector Filter. Specifications - Hoya 49mm Pro-1D MC Protector Filter. Compatible with lenses that accept 49mm filter. Digital multi-coated exclusively reduce the appearance of lens flare and ghosting caused by reflections. Skylight 1B. Classic HOYA filter. 49mm thread fit. Made in Japan. Optics are clean and free from any marks or scratches. _gsrx_vers_823 (GS 7.0.12 (823)). HOYA, the world renowned optical glass manufacturer. As with all HOYA multi-coatings,HD HMC is applied in a furnace at high heat, bonding the coating to the surface of the glass. The chemistry of the top layer is formulated not just to be more durable but to be resistant to oil stains. ♢ TV aerial (M) to TV aerial (F). ♢ TV aerial (M) to TV aerial (M). ◈ Barb Fittings. ♢ TV aerial (M) to F connector. 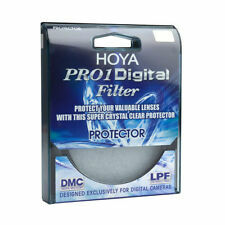 Hoya 72mm HD Protector (Clear Filter). ◈ Air Filter. ◈ Battery Storage Cases. Hoya's professional-grade optical glass. Antistatic coating repels dust. LENS PROTECTOR. In mint condition. For protection, and for protection only. Fingerprints and smudges wipe away cleanly. Water repellent - water beads up and wipes away easily. Hoya 77mm Pro 1 digital MC UV(0) filter, no case. Hoya 77mm Pro 1 digital MC UV(0) filter. No case or pouch included, the filter will be supplied loose. The choose and buy the best filter is essential, only rely on this to give full play to the performance of your precious lens. HOYA filter to ensure the best quality standard,make you easy to obtain outstanding photography. Hoya 77mm HMC UV(C) filter, including case. Circular Size: 43mm. Filter Type: Protector. Filter Material: Glass. Key Features. Key Specification. Super multi-coating eliminates reflections on the surface of the glass and enhance light transmission. Hoya 72mm HMC UV (c) fllter. No case or pouch included, the filter will be supplied loose. Skylight 1A. Classic HOYA filter. 67mm thread fit. Filter only. Made in Japan. Note - A couple of tiny coating blemishes, but they are hardly noticeable and dont effect the performance. _gsrx_vers_823 (GS 7.0.12 (823)). 12 layers of Multicoating are applied to each optical surface to produces an average transmission of 99.7%, and maximum surface precision. HMC coating increases resistance to flare and stunning images can be recorded at wide apertures without compromising the performance of any lenses. ♢ TV aerial (M) to TV aerial (F). ♢ TV aerial (M) to TV aerial (M). ◈ Barb Fittings. ♢ TV aerial (M) to F connector. Hoya 77mm HD Protector (Clear Filter). ◈ Air Filter. ◈ Battery Storage Cases. The 8-layer multi-coating reducing flare, ghosting, and reflections on the filter surface for a higher light transmission of 99.35%, resulting in greater contrast and colour fidelity. Model HD2 Protector. No warranty implicit or implied. Hoya 58mm Skylight (1B) filter. EXC++ cased condition. Top quality! Hoya 58mm Skylight (1B) filter. In EXC cased condition! Lenses would be optically clean. Lenses may have dusty and/or optical blemishes which shouldn't affect image quality. This is the lowest users grade.